Bad Veins is an indie rock duo from Cincinnati, Ohio, composed of Benjamin Davis and Sebastien Schultz. Davis primarily writes the music, plays guitar and keyboard, and sings, while also recording backtracking music on areel-to-reel tape player, nicknamed Irene. Schultz plays the drums. Davis also uses a megaphone and telephone to sing into, producing a unique sound. The band is known for dressing in vintage military clothing when performing––Davis' jacket belonging to his father who served in Vietnam. Army green and a rose design, similar to their debut album cover, were a visual staple when touring for the album. In 2008, Bad Veins won the first ever Target Music Maker Award at the Tribeca Film Festival. Their self-titled debut album was released on July 21, 2009. The first single off the album was "Gold and Warm," which was used on Good Morning America’s "Your Three Words" segment on February 27, 2010. Dan Harris, an ABC News correspondent, named the debut the 7th best album of 2009 on ABC’s Amplified blog, calling it "criminally overlooked" and "utterly fantastic." The USA Today blog Pop Candy named the last track on the album, "Go Home" one of the Top 20 Songs of 2009. 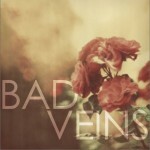 Bad Veins has garnered considerable praise in the blog scene. 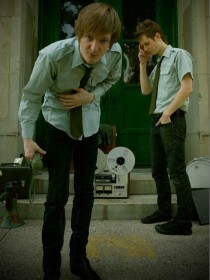 A post on Radio Free Chicago discussed the band's new EP, titled Outliers, which came out on June 15, 2010, and described the duo's stage dynamic: "At the end of the day, Bad Veins is one of the midwest's most talented bands, regardless. They're comprised of one of the most passionate and energetic drummers I've ever seen and Davis is a talented composer and singer to say the least. After seeing Davis play a number of solo shows, I can attest to the fact that the slight distortion used on his voice is not to mask any weakness but instead is a deliberate affect used by Davis to suit the songs. Without the stage tricks that Bad Veins is gaining notoriety for, Davis could be a great folk musician, and a number of moments on Outliers showcase just that."